TRENTON — With just hours left before a midnight deadline, Gov. Philip D. Murphy of New Jersey and Democratic legislative leaders brokered an agreement on the budget to keep the government open and avoid a state shutdown for the second time in two years. The deal arrives just in time for the coming Fourth of July holiday and saves Mr. Murphy, a Democrat, from closing the government during his first year in office, a move that would prove unpopular to many, including bathers looking to cool off on a sweltering weekend at state parks and beaches. The nearly four-month budget showdown centered largely on an impasse regarding a tax increase for the wealthiest in New Jersey. But with the two sides staking out seemingly intractable positions for months, Mr. Murphy; Stephen M. Sweeney, the Senate president; and Craig Coughlin, the Assembly speaker, all made concessions to reach a deal. The budget agreement will raise the income tax to 10.75 percent from 8.97 percent on those making more than $5 million a year. The deal also includes an annual surcharge of 2 percent on companies that earn over $1 million annually that will be in place for four years. Mr. Murphy’s proposal to raise the sales tax to 7 percent from 6.625 percent was left out of the final deal. The $37.4 billion budget includes financing for nearly all of Mr. Murphy’s proposed investments, including a $242 million increase in funding for New Jersey Transit, an additional $83 million for prekindergarten, an extra $25 million for community colleges and a $3.2 billion payment into the state’s struggling pension system. But many of the revenue sources Mr. Murphy sought in his budget proposal in March — roughly $1.5 billion in new taxes — differed in the final deal, including the decision to leave the sales tax at its current rate. The agreement on the so-called millionaire’s tax was very similar to an earlier proposal from the Legislature — to raise the income tax on those making $5 million or more to 9.95 percent — that just a day before Mr. Murphy had dismissed as merely “symbolic.” The governor had been seeking to tax those making more than $1 million, offering only a slight adjustment early Saturday morning. Still, legislative leaders had initially been resistant to the idea of any income tax increase in a state where residents already face some of the most onerous tax burdens in the country. But the prospect of a second shutdown in two years, which would have been an unwelcome stain on Mr. Murphy’s first year in office, proved motivation enough for both sides to broker a last-minute deal, despite weeks of bitter negotiations characterized by personal attacks. Mr. Murphy and legislative leaders were adamant that their differences were not as severe as it appeared during the monthslong standoff. The mere threat of a shutdown infuriated many residents of the state, who were decamping to state parks and beaches for extended holiday vacations. When the state shut down in 2017, Island Beach State Park and the rest of the state park system closed, forcing campers to pack up early and leaving a 10-mile stretch of beach vacant, except for the now infamous gathering of former Gov. Chris Christie, a Republican, and his family. At Bass River State Park, Jose Pitre and his wife, Maria Arce, have had their family reunion at the same campsite every year over the Fourth of July, with relatives driving as far as eight hours from Buffalo to get together. But last year they were asked to leave their campsite when the state government shut down. Believing it would not happen again, they made reservations in January 2018 for their same family reunion camping trip. When they found out that they could get evicted again, the family decided their patience was exhausted. The current disagreement began in March, when Mr. Murphy released his first budget. While Mr. Sweeney had at first supported a tax on the wealthy after Mr. Murphy’s election in November, pledging it would be the first bill he passes, the Senate president reversed course following the passage of the federal tax law that limited state income and property tax deductions. But Mr. Murphy, who had campaigned extensively on raising taxes on the well-off, included the millionaire’s tax in his inaugural budget, leading to a stalemate. By Saturday, neither blinked until the final hours. While 2017 was marked by budget standoffs in statehouses around the country, New Jersey is an outlier this year as the last state in the country that hadn’t reached some sort of a budget agreement by the fiscal deadline, according to the National Conference of State Legislatures. Last year, the state remained shut down for three days, but national headlines followed the infamous photographs of Mr. Christie lounging on the beach with his family in Island Beach State Park, which had been closed as a result of the budget standoff. The last time the state shut down under a Democratic governor was 12 years ago, when former Gov. Jon S. Corzine battled the Legislature over raising the sales tax during his first year in office. That shutdown, the first in state history, lasted eight days. Despite a resolution, some residents remained frustrated by the behavior of the state’s leaders. Jason Long, a facilities manager from Audubon, Penn., was relaxing on Island Beach State Park with his father-in-law on Saturday morning, angry that for the second year in a row, their weekend was still in doubt. “Why don’t they work this out in the winter months?” asked Mr. Long. New Jersey barely escaped its second government shutdown in as many years Saturday, as Gov. Murphy and lawmakers announced a last-minute budget deal that will increase taxes on millionaires and corporations. "This is not a win for any of us individually," Murphy said at a Trenton news conference with legislative leaders. "This is a win for the middle class and working families, and those who look up and dream to be in the middle class all across New Jersey." No government services would be shut down, Murphy said in announcing the agreement about 7:40 p.m. Saturday. The Legislature will meet Sunday to begin turning the deal into law. Despite sharing a political party, the Democratic governor, who took office this year, and leaders of the Legislature had been at odds for months over proposed tax increases to pay for more spending on education, workers' pensions, and public transportation. Under the deal, a higher tax rate would be imposed on income over $5 million -- a threshold lawmakers had proposed, and much higher than the $1 million level Murphy favored. "The millionaires tax was an existential item for me," he said. Murphy said lawmakers agreed to "meaningfully" increase the new tax rate on income over $5 million, from the 9.95 percent they initially proposed to 10.75 percent. The corporate business tax would increase an average of 2 percent over four years. But the governor agreed to drop his proposal to raise the sales tax. The new fiscal year began at midnight Sunday. Without a budget deal, the state faced a potential shutdown of nonessential services -- including state parks and beaches, racetracks, and Motor Vehicle Commission offices. While Murphy and legislative leaders had always agreed on spending priorities, the problem has been how to pay for it all, with widely divergent preferences for new revenue. Lawmakers had bucked Murphy's call for a millionaires tax to fund the new governor's agenda, while Murphy had argued the $36.5 billion budget the Legislature passed last week wouldn't provide sustainable revenue. During his campaign, Murphy pledged to raise taxes on millionaires, promising a progressive agenda and renewed investment in schools and infrastructure after the tenure of Gov. Chris Christie. Senate President Stephen Sweeney (D., Gloucester) had also favored a millionaires tax. But he changed his tune after President Trump's tax overhaul capping a deduction popular with New Jerseyans, saying a rate hike would drive wealthy residents from the state. Instead, Sweeney and Assembly Speaker Craig Coughlin (D., Middlesex) pushed an increase in the corporate business tax -- which they say would capture some of the profits flowing to corporations under the federal tax changes. Under the deal struck Saturday, a surcharge averaging 2 percent over four years would be added to the corporate tax rate of 9 percent for corporations with profits over $1 million, Murphy said. The time frame is longer than what lawmakers initially proposed, but the increase less severe: Lawmakers would have raised the tax for two years from 9 percent to 13 percent on corporations that earn at least $25 million; that rate would have been the highest in the nation. The agreement "will ensure we remain competitive as we work to grow our economy," Murphy said. Under the budget deal, the sales tax will not increase. Murphy had wanted to restore the tax to 7 percent, after Christie and lawmakers reduced it to 6.625 percent in a 2016 deal to raise the gas tax. "It is no secret that New Jersey faces real challenges. They weren't created overnight, and they won't be solved overnight," Murphy said. "But this is a strong first step." Some of the deal's contours were included in a letter by the governor to lawmakers that was released by Murphy's office Saturday morning. The final version of the millionaires tax, however, didn't match Murphy's proposed compromise -- which was a 10.75 percent marginal tax rate on income over $1.75 million, up from his desired level of $1 million. The current top rate is 8.97 percent and applies to income above $500,000. At Saturday's news conference, Murphy referred to the agreed-upon tax on income over $5 million as a "millionaires tax" and called it a first step toward a fairer tax system. State government shut down for three days last year after Christie and lawmakers failed to reach a deal involving the state budget and changes Christie wanted to make to the state's largest health insurer. That shutdown ended on the Fourth of July -- but not until after Christie was photographed lounging with his family at the otherwise-closed Island Beach State Park, drawing intense criticism. Lawmakers will be returning to Trenton on Sunday for voting sessions. As for Murphy, he said Saturday night that he will not be heading to the beach. He has bills to sign and mayors to swear in, and is "hoping to see a little bit of soccer." Did Phil Murphy and top Democrats shoot N.J.'s economy in the foot with their budget deal? Around dinnertime June 30 -- with the clock ticking toward the midnight deadline -- New Jersey's state budget deliberations were at a turning point. Gov. Phil Murphy and top state lawmakers, straining to avoid another state government shutdown, emerged from the harried meetings with a deal in principal. They would cover the state's growing expenses by hiking taxes on both the state's wealthiest earners and biggest corporations. Then came a day-long behind-the-scenes scramble to put the finishing touches on the complex agreement. By the time the ink had dried, New Jersey's business community said this is what happened: Murphy and his fellow Democrats who lead the state Legislature had shot the state's economy in the foot. This bundle of hasty tax increases could hamstring economic growth for years, industry and tax policy experts said. "If I were asked to make a list of tax policy changes that would do maximum harm to New Jersey's competitive position and long-term economic vitality, I would have a hard time improving upon the last-minute budget compromise," Andrew Sidamon-Eristoff, a treasurer under former Gov. Chris Christie, a Republcian, said in a recent column. From those negotiations came a four-year increase in the Corporation Business Tax, new rules for how multi-state enterprises report income and a tax on profits that corporations with foreign subsidiaries were accumulating and keeping overseas. Democrat Murphy and his party leaders in the Legislature also agreed to hike taxes on personal income over $5 million. And they placed new taxes on ride-sharing, internet rentals like Airbnb and e-cigarettes in order to push more money into schools, transit, government worker pensions, property tax relief and items on Murphy's progressive wish list. A spokesman for Murphy, Mahen Gunaratna, said those "critical investments" will spur economic growth to pick up speed. We break down the new state budget for you. "Through his budget, the governor has shown his commitment to strengthening New Jersey's natural assets -- strong public schools, a highly-skilled workforce and strategic location between large markets -- to better position the state for the 21st-century economy," Gunaratna said. But of the more than $1 billion new taxes imposed, businesses will bear the brunt. From small business owners to New Jersey's 22 Fortune 500 companies, nobody will like being treated like the Garden State piggybank, said Jon Bramnick, the state Assembly's Republican leader. "The people who are most upset, you're never going to hear from," Bramnick, R-Union, said. "They don't do press conferences. They don't call and say, 'Hey, I'm leaving.'" Murphy certainly wasn't shy about raising taxes. He saw a millionaires tax -- a 10.75 percent marginal tax rate on personal income over $1 million -- as the way to make the state's well-to-do pay their fair share. He also proposed a fraction of a percentage point increase in the sales tax, which he said would reverse a Christie-era "gimmick" that put little back in the taxpayers' pockets. State Senate President Stephen Sweeney, once a supporter of the millionaires tax, had a change of heart after federal tax reform capped state and local tax deductions at $10,000 and, he said, put high-tax New Jersey at risk of turning off high-income residents. Assembly Speaker Craig Coughlin, whose caucus stands for reelection next year, positioned himself against a sales tax hike or any that would "balance the budget on the backs of New Jersey's families." The legislative leaders instead put a target on big businesses, saying they were delivered a huge windfall from federal corporate tax cuts and New Jersey ought to take a sliver. Sweeney, D-Gloucester, and Coughlin, D-Middlesex, pitched Murphy a two-year surtax on New Jersey's biggest businesses, bringing the rate to a nation-high 13 percent. Murphy begrudgingly agreed to a lesser tax on corporations, and they had a deal. The budget agreement included a four-year increase in the Corporation Business Tax for businesses with net income over $1 million. They'll pay an additional 2.5 percent for two years and then 1.5 percent for two years before the rate returns to 9 percent. At 11.5 percent, the new rate is the second highest in the country, lower only than Iowa's. Regionally, it clocks in higher than New York (6.5 percent), Pennsylvania (9.99 percent), Delaware (8.7 percent), and Connecticut (8.25 percent). Sweeney said Friday he would have preferred to not raise any taxes but hopes the impact of a temporary increase will be minimal. He said he would like to be able to repeal the multi-millionaires tax, too. "Of course I'm concerned," he said. "I didn't want to do any taxes ... I didn't like any of them. I offered the CBT as a compromise and as a temporary fix, because there are things we need to do to fix New Jersey." It's a reputation problem more than anything, business insiders said. The tax change won't dramatically increase most business' bottom line, but it will damage the perception of New Jersey, said David Shipley, a tax attorney at McCarter & English. "The higher rate sends a message that New Jersey is not friendly toward business," Shipley said. "The message it sends is really going to be overshadowing the reality that there's not going to be a big difference." Bramnick, too, said he is concerned the tax package signals that New Jersey's notorious tax landscape isn't getting better -- it's getting worse. "I think it's a very, very dangerous message to taxpayers and to business people," he said. "Even if things just stayed the same, they could muddle through." State-level tax policy is all about a state's competitive position relative to its neighbors and the nation as a whole, Sidamon-Eristoff told NJ Advance Media. "I believe the best possible tax policy is one that is frankly unremarkable." "Having a very, very high corporation income tax rate, I think, is problematic. We're going to be at least for a few years No. 2 in the country. I think that's a mistake," he continued. "I think it makes it more difficult to convince companies to come to New Jersey or grow in New Jersey and invest in New Jersey." Bracken said he expects a surge in efforts to poach New Jersey's major businesses. "It's a very competitive environment. It a state sees a weakened entity that is a pot of gold, which New Jersey is, why not go after it? It just makes sense that they'd be coming for our companies," he said. The governor of Texas publicly offered a "lifeline to businesses and families throughout New Jersey who are looking for greater economic opportunity and relief from high taxes." The tax changes aren't just hitting the big guys. The deal included a new 10.75 percent top marginal tax rate on personal income over $5 million. Owners or partners in pass-through entities -- sole proprietorships, LLCs, and S corporations -- who run profits through their individual income tax return face this new multi-millionaires tax. Sidamon-Eristoff said he feared it will provide an extra incentive for people who have created wealth in the form of a business to move their tax residency before they sell that business. The Murphy administration said the multi-millionaires tax will hit only about 1,760 tax filers in New Jersey. It won't take many of those to rearrange their tax residency for this to be a wash -- or money loser -- for New Jersey, Sidamon-Eristoff said. "I think that the mega-millionaires or multi-millionaires tax ultimately makes New Jersey less desirable a place to build a business and then sell a business after you've successfully built a business into a going concern." he said. Bracken also warned that will have an outsized impact on the state's economy. Job losses and price increases shouldn't be unexpected, he said. "It just spreads." "One of the things the state is notorious for is not properly vetting these things and not understanding the unintended consequences," he added. As the behind the scenes talks over the tax plan's details dragged that hot July 1 afternoon, industry reps were nervous. The Statehouse halls and tunnels typically filed with students, activists, lobbyists, lawmakers and staff were mostly bare. John Holub, president of the New Jersey Retail Merchants Association, stood among the industry groups and government affairs agents waiting outside a rare Sunday legislative session for votes on budget-related bills. Specifically, Murphy's administration and lawmakers were nailing down language on new requirements on how businesses with operations in New Jersey and other states are taxed, something called unitary combined reporting requirements. Murphy had described it as closing a loophole that allowed businesses to get out of paying their fair share to New Jersey. "The ramifications are unknown right now," Holub said as he waited for the deal on July 1. "They're literally writing this legislation on the back of a cocktail napkin, in a sense." Holub called it a shock that combined reporting was part of the final state budget package and said he and others had been "led to believe" it had been dropped for the time being. A source familiar with the negotiations told NJ Advance Media that legislative leaders had signaled to the industry lobbyists that there would be no combined reporting. "The business community clearly was not happy about a (corporate business tax) increase ... but to combine that with combined reporting makes it even worse," Holub said. "I have a feeling we won't know for quite some time who exactly is impacted and to what extent," he continued. Combined reporting rules are meant to capture tax revenue from multi-state enterprises that may shift their profits to states with lower or no corporate income taxes to lower their tax liability here. Essentially, a corporation must now add up the income from all companies within a group of related businesses and then apportion a percentage of that income to New Jersey. It's not an across-the-board tax increase, but Bracken likened it to trying to "corral silly putty." "If you squeeze in one way, something else pops out." In the past few weeks, Gov. Phil Murphy and the state Legislature enacted major tax increases and made a record-breaking payment to New Jersey's deeply underfunded pension funds. Last week, Senate President Steve Sweeney, D-Gloucester, proposed structural reforms and spending cuts that would, if enacted, marginally improve New Jersey's financial condition. But these moves -- made in good faith by leaders who inherited a mess -- don't change the unaddressed, underlying reality: New Jersey has made promises to state and local government workers that cannot possibly be met. Sooner rather than later, New Jersey will have to cut these promises -- not just for future hires, but for current employees. The real question is how to limit the damage. That's where real options can be found that are relatively fair, given the circumstances. The new taxes, however extensive, will not generate enough revenue to pay off the current pension promises. The corporate tax increase is ostensibly only temporary -- a move made to convince businesses to ride out the losses rather than decamp for lower-tax locales. If it is not made permanent, the new revenue will dry up. But if made permanent, the tax hike will drive away even more native businesses, lowering total tax receipts. High earners may also take flight to other states. Some have already left for sunnier, cheaper shores. New Jersey had already lost more native-born, relatively wealthy citizens, and houses more residents who say they're ready to go than any other state. More people, now faced with losing more than a dime in every dollar to Trenton, will surely follow. What then? Meanwhile, even the $3 billion-plus contribution budgeted for the coming year will not sustain current pension promises. The actuarially sufficient number is almost certainly well north of $5 billion per year. There is no reasonable scenario under which such massive annual payments can be made, considering that even this year's payment relies heavily on short-term gimmicks. Having admitted the truth, leaders should start by developing a final, new, affordable tier of benefits to apply not only to all future workers, but to all work not yet performed by current employees. It isn't fair that more cuts fall on the youngest workers, as they have for years. Ok, Sweeney's not really the governor. But he is driving the agenda, filling a vacuum left by Gov. Phil Murphy, who has presented no credible plan to face the fiscal crisis. This new tier of benefits should consist mostly of pension vehicles that resemble the 401(k)s available to private-sector workers. These require worker contributions coupled with "defined contributions," rather than "defined benefits." That way the state knows, and can fund, exactly what it's promising. If it's too big to realistically pay, then New Jersey will need -- finally -- to do the politically ugly but financially necessary thing: start cutting already-earned pension benefits. There are relatively equitable ways to do this. Set an absolute cap of perhaps $100,000 or $125,000 per year, indexed to inflation, on benefit payments. Cut benefits that pay current or future retirees more than they earned in base salary while working. Reduce "spiked" benefits. Do this while completely safeguarding benefits below a certain comfortable-retirement threshold. None of this will be fun. But if the promises can't be met, honesty and fairness requires that what must be done, be done quickly. Scott Shepard is the author of a new study on New Jersey pensions published by the Mercatus Center at George Mason University. TRENTON, N.J. (AP) — New Jersey's Senate president is pushing a raft of cost-saving proposals to rescue the state from potential fiscal ruin, but the bipartisan recommendations face an uncertain future in the Legislature and with Gov. Phil Murphy. Senate President Stephen Sweeney, a Democrat, unveiled the recommendations on Thursday from the Economic and Fiscal Policy Workgroup after seven months of consideration by the 25-member panel. Among the recommendations is shifting state and local workers from a defined-benefit pension plan to a hybrid 401(k)-style plan for new workers and those with fewer than five years of service. The panel also is calling for cutting health benefits for retirees from platinum plans to gold. Other changes include merging school districts into regional systems that would go from kindergarten to 12th grade and allowing for the voluntary establishment of up to two countywide districts as a pilot program. Another proposal calls for reviewing the state's sales tax exemptions. The committee also recommended exploring the viability of transferring major assets, such as the New Jersey Turnpike system, to the state pension to lower the retirement system's unfunded liability. Sweeney pledges a series of meetings across the state to push for the changes the panel recommended and says he expects a political battle over the measure. "Of course we're going to have a fight," Sweeney said. "Any change that's worth anything comes with a fight. The easy stuff is done. It's gone." A particularly challenging issue is pension and health benefit changes, which continually bedevil the state and represent what the committee calls a $152 billion liability. Republican and Democratic reaction to the recommendations has been mixed. Assembly Speaker Craig Coughlin, a Democrat, says he looks forward to reviewing the proposals. Murphy, also a Democrat, said he welcomes a conversation, but he stopped short of embracing the proposals. Tellingly, the state's biggest teachers' union, the New Jersey Education Association, which has feuded fiercely with Sweeney in recent years, bashed the plan. "The report glosses over the state's failure to meet its obligations and get its fiscal house in order," the union's leaders said in a statement. The union is a major Murphy supporter, which strains relations with Sweeney because he faced a Republican challenger bankrolled by it in last year's election. The bad blood between Sweeney and the union goes back to his support for pension changes under Gov. Chris Christie, a Republican. Senate Minority Leader Tom Kean Jr., a Republican, said the proposals mirror what the GOP has put forward before and he's confident his caucus can work with Sweeney. But other Republicans don't sound so open. Doug Steinhardt, the state party's chairman, suggested the calls for lowering costs and cutting benefits to help the state's strained budget weren't sincere. "While their words today say they want to own the lower tax narrative, their actions kill it," he said. He pointed to this year's budget, which hiked taxes on annual incomes over $5 million and rates on businesses making more than $1 million. Business groups praised the effort to make the state affordable. But they want more time review and "digest" the recommendations, state Chamber of Commerce President Tom Bracken said. Whether any of the proposals makes it to Sweeney's desk is unclear. Sweeney promised committee hearings with some legislation expected to be drafted in the coming months. Up next, Sweeney said, would be the hiring of an actuary to crunch the pension figures. As of Thursday, the potential savings, or costs, of any of the proposals was unclear. Sen. Declan O'Scanlon: New Jerseyans are being screwed. And we're so close to colossal, system-crushing-failure, we can't get away with looking the other way anymore. Gov. Phil Murphy won election in a landslide after pressing for a muscular expansion of government. But the fiscal crisis he inherited is blocking his path. NJ.com is now available weekdays on the smart speaker. Say, 'Alexa, What's Happening Around New Jersey?' for top stories and a fact of the day. With well-reasoned solutions on the table, there's no excuse for continued inaction. New Jersey is still fixable, but we are running out of time. State Sen. Steven Oroho, R-Sussex, is co-chair along with state Sen. Paul Sarlo, D-Bergen, of the bipartisan Economic & Fiscal Policy Workgroup. He also serves as the Senate Republican Conference leader. "Those rising benefit costs, combined with long-standing inefficiencies and known abuses, have driven all levels of government in New Jersey to a state of perpetual fiscal crisis." "Our proposals, if enacted, would produce billions in savings for taxpayers through public employee benefit reductions, new school funding reforms, and increased efficiencies that can be realized by our local governments and school districts. For example, we recommended reducing platinum-level health benefits for public employees to still generous gold-level plans, producing more than $1 billion in savings to taxpayers, and we proposed pension system reforms that would reduce a massive unfunded liability while protecting the benefits that current employees and retirees have earned." 4. Reducing benefits for current employees and retirees is one of only two ways to reduce unfunded liabilities (the other being to have taxpayers pay it off). 5. Why is it OK to reduce health benefits already ‘earned’ but not pensions? * Based primarily on my experiences with Union County government. Others, usually the smaller ones where there is not as much taxpayer money to pilfer (and the ones this workgroup seeks to abolish), may work efficiently. The New Jersey legislature will meet this Monday with one item on the agenda – more money for campaign donors through debt. According to an OLS estimate the total debt service payments would range between $1.726 billion, assuming the bonds are issued at a four percent interest rate, and $2.168 billion, assuming a six percent interest rate. Most to be repaid by ‘the children’ (assuming they can afford to stay). What are your thoughts on this bill (now proposition) since they've dropped the number down to 500M? Honestly, it seems like it could be a worthy use of govt funds but I can't understand why if it's so important and has bipartisan support, they couldn't find room for it in the budget? 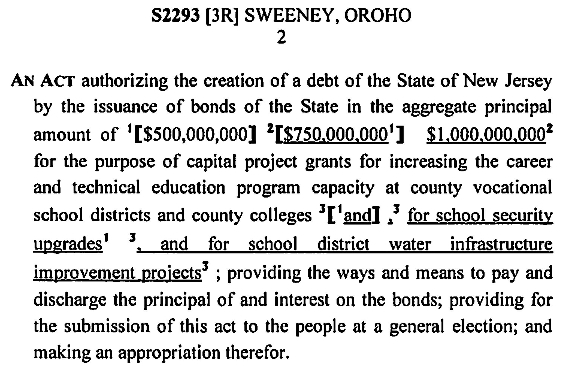 I just don't like the idea of issuing bonds to handle things that should've been budgeted for (i.e. deteriorating water supply in public schools. Should've we have been able to predict this would happen and plan accordingly?). Not campbell, but the only reason I can think of to not include expenses in the budget is so politicians can claim they didn't technically raise taxes or increase government spending or some nonsense like that. Money is fungible, and whatever is spent needs to be collected in the form of taxes, either today or in the future. Price obfuscation is always a negative for the consumer. Last edited by WellThen; 11-06-2018 at 02:32 PM.. They seemed okay with trying to do it through the legislature.